An intranet or website is more than a project or a piece of technology; it’s a mission-critical business system and a significant investment that requires proper planning. Prescient has a five-phased approach or methodology that our Internet consultants use to creating highly effective websites. 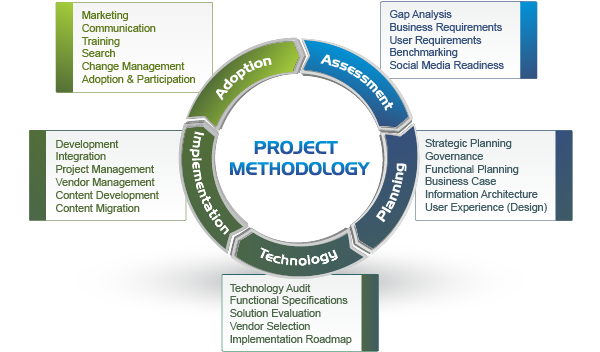 The first phase of this methodology is the Assessment phase, where the business and functional requirements of the intranet or website are determined and documented, followed by the all-important Planning Phase. Despite the traditional focus on technology and integration, the most critical phases are the initial ones: Assessment and Planning. At the heart of a website's success is the strength of the plan that governs it, and a successful plan requires a process that is exemplified by Prescient’s unique methodology that is focused on Planning. Prescient’s Intranet Plan © 2013 service (and the accompanying Internet version) is the all encompassing website and intranet design and blueprint for building or redesigning an intranet or website. Using our unique intranet methodology, our consultants construct a complete website or intranet plan that encompasses all the details including information architecture, governance and design. Prescient Digital Media does not use a proprietary technology for building or constructing client intranet sites or intranet portals. We are ‘technology neutral’ which means that we will work with you to identify the appropriate technology solution based on your business requirements, and not "who we know" or based on reselling agreements and commissions. For more information on our Website / Intranet Plan service or our other consulting services please contact us directly or phone our main office at 416.926.8800.